Many questions we ask each other in meetings or email are asked not to elicit information, but to "ding" each other. Here's part two of a little catalog of nasty questions. See "Nasty Questions: I," Point Lookout for November 8, 2006, for more. A 1940s-era trap fishing boat approaching the trap at 5:00 AM off Provincetown, Massachusetts. 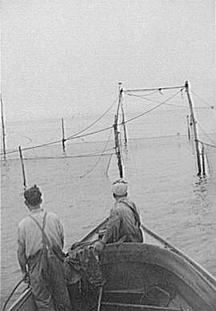 The trap is a large circle of net with a long funnel-like entrance set in to the tide stream. Fish, which follow the tide, get caught long before they realize it. Photo by Edwin Rosskam, U.S. Office of War Information. Courtesy Town of Provincetown. Questioners sometimes want to pressure the respondent. For example, just as the respondent begins an answer to a difficult question, the questioner can interrupt with "What's the short answer?" or "We've got a long agenda here…"
The questioner's purpose is to make it easier to attack the respondent's answer. Responding to pressure tactics can be tricky, but since everyone knows what's going on, a powerful response to the how-long-will-this-take question might be "It depends on what quality of answer you want." When someone proposes an alternative solution to a difficult problem, it's a cheap shot to ask, "How much will that cost?" or "How long will that take?" The questioner (and almost anyone) can guess that cheap shots will have embarrassing answers or no answers at all. That's what makes cheap shots cheap. Cheap shots are supposed to demonstrate weaknesses indirectly. It's usually best to respond honestly. For instance, "We don't know that yet, of course. Would you like an estimate by Friday?" Here the questioner hopes the response will be acceptable, and more direct tactics will be unnecessary. For instance, after discussing acceptable resource levels (in effect, supplying the "right answer"), asking what resources are needed might just elicit an acceptable response. Truth is your best ally. When asked for estimates on the spot, it's best to supply them with appropriate confidence levels: "Just as a guess, I'd say 100 person weeks plus or minus 50%. I can get you a better estimate by Friday." In a sequence of seemingly unrelated questions, with perhaps some truly irrelevant questions thrown in, the questioner lays a trap that constrains the respondent's answers to the "trap question." This technique relies on the desire of most of us to be consistent, and our wish to avoid backtracking or correcting previous responses. Trap construction questions that contain presuppositions [Brenner 2004] that conflict with the hypotheses of the trap question are especially effective. If you get trapped, look for presuppositions, and be willing to backtrack or be inconsistent. Usually asked publicly, zingers are vehicles for reminding bystanders of past infractions, or weaknesses of or accusations against the target. Example: "Weren't you the project manager for that Disaster last year?" Most people know what's really going on. Such questions (and likely, the questioner) are toxic to the organization. Choose whether or not to respond — a silent smile might be enough. Would you like to see your comments posted here? rbrenuiDSrqbarsePIvkIner@ChaclaQeEOdeSKnJAstJoCanyon.comSend me your comments by email, or by Web form. See also Workplace Politics, Effective Communication at Work and Conflict Management for more related articles. I offer email and telephone coaching at both corporate and individual rates. Contact Rick for details at rbrenfryFFJOwaLfzkMVkner@ChacAFgbYGxIYUKAQcQhoCanyon.com or (650) 787-6475, or toll-free in the continental US at (866) 378-5470.